Lambda Literary Awards: The best LGBTQ books of 2015. 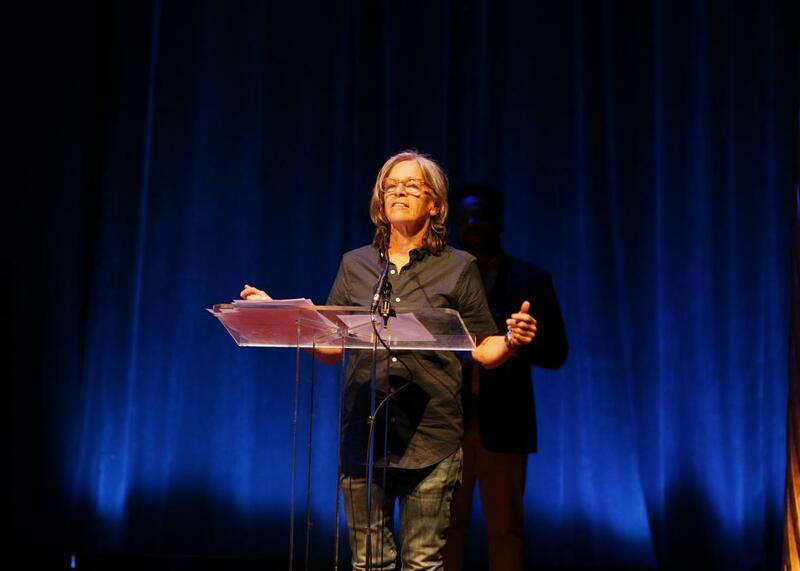 Eileen Myles at the Lambda Literary Awards on Tuesday. Comedian Kate Clinton’s first target as host of Monday night’s 28th Lambda Literary Awards was Donald Trump. “It’s like binge-watching the Armageddon,” she said of the Republican candidate, before leading the audience through the night’s 26 categories, taking in everything from gay erotica to the first Lammy for transgender poetry. The Pioneer Award was presented to Eileen Myles by poet Natalie Diaz, a member of the Mojave and Pima Indian tribes, who smilingly noted the irony of being asked “to give a white woman the Pioneer Award.” She quickly added, “I’m just kidding, I love white women—it’s one of my colonial vices.” Myles, in on the joke, took the stage wearing a Davy Crockett-style coonskin cap.